The other day I checked in with the group in the shoulder series and asked how their shoulders were feeling. One student answered, They feel powerful! What a great way to feel. Powerful. Completely slump — let the shoulders round forward and hang the head. How does this feel? To me it feels sad. Like I can’t take it anymore. There’s no hope. And after a minute or so I get really really tired. Now pull your shoulders back and pop your chest out (just don’t let my anatomy friend see you). How does this feel? This one is tricky for me. It camouflages itself as powerful pretty well, but if I really tune in and listen, I can feel how it’s a false sense of power. It’s more like force or bullying, with undertones of desperation and insecurity. Find the center point between those two. Imagine you’re rising equally from your front and back torso, growing tall from the inside right out the top of your head. Let your shoulders widen, as though you’re effortlessly pressing your outer arms into an imaginary hug. Let your eyes find a point straight forward from eye level. I feel present, like I’m greeting the world from an embodied and alive place. How do your shoulders feel right now? Is your load too heavy? Are your shoulders tired? You may need to delegate and take a nap; you could also try changing your posture and see if it changes your feeling. ‘Cause it works both ways. 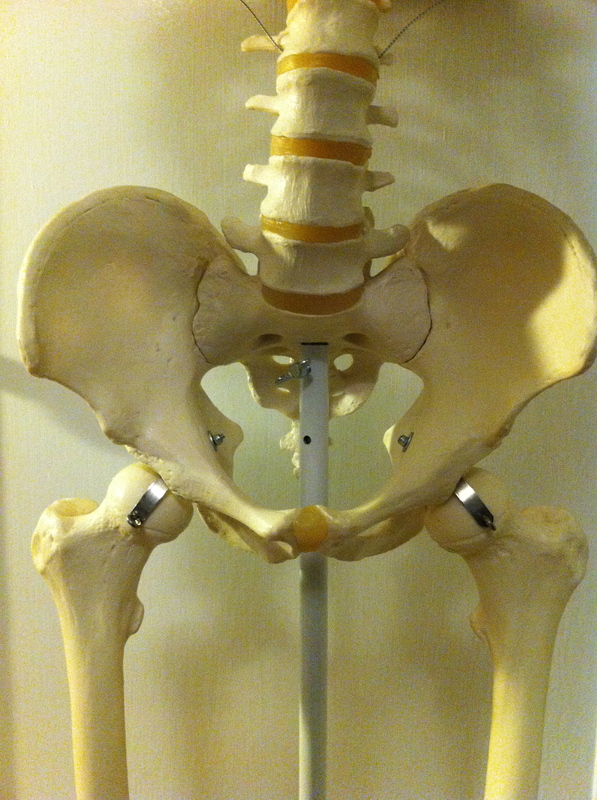 Did you download your free class on the hips? Let me know what you think! The first class in the series The Six Degrees of the Hip happened today. Oh. my. god. Give me a skeleton named Fred and a microphone and I might never stop. 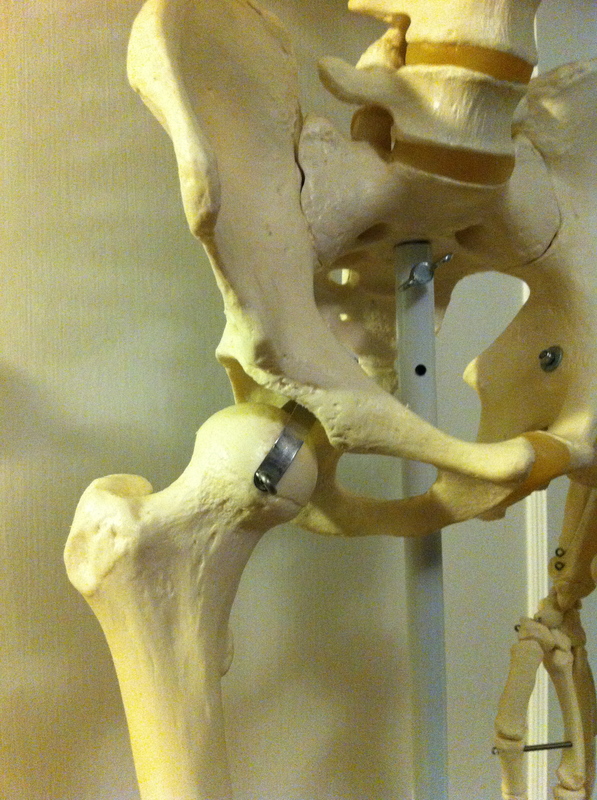 Today we talked about the construction of the hip and played around with external rotation. Since this is an action that is often overdone in yoga asana classes, we focused on fine tuning. My hope was to provide some tips that will be useful in ongoing classes. And the cool thing…? You can be part of the class!! Sign up to get each class (the afternoon of the real class) for just $24. Six audio recordings that you can play from iTunes. To keep forever. 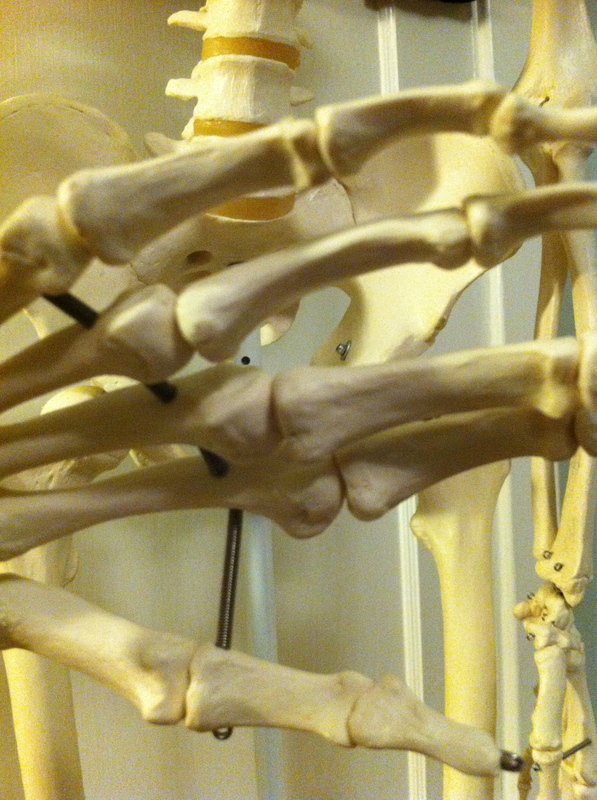 Anatomy, practice and teaching tips, plus a basin (the translation of “pelvis”) of information on your body. 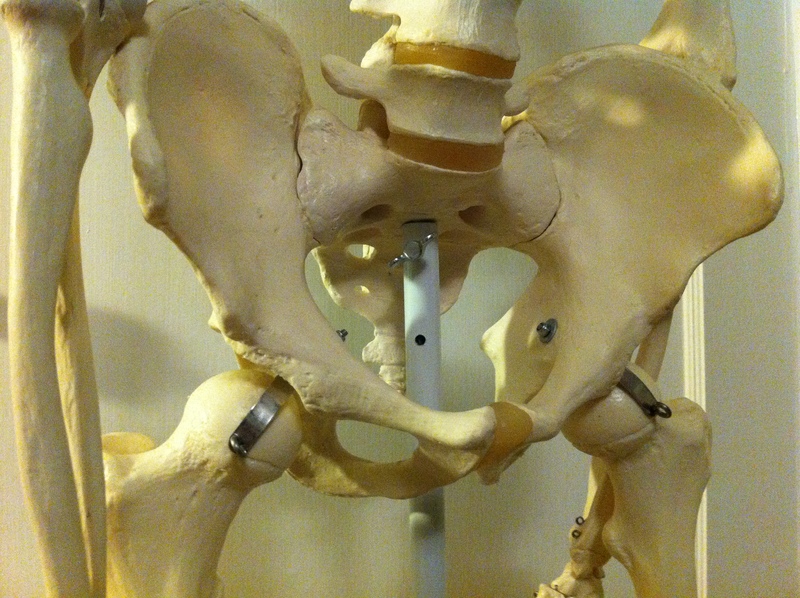 If you want to sing the praises of your pelvis, come on over here (click on the pelvis). Once I get the notification of your purchase, I’ll email the link to the classes to you. Class will be uploaded on Tues/Thurs afternoons ending June 16th. Contact me (michelle@itsallyoga.com) if you have any questions. Two things about having a kidney stone are true: 1) you are likely to have another; and 2) you would do anything to not have another. Enter Dr. Low, nice but overworked and generally unhelpful urologist. My appointment was to hear analysis of tests that were done to find out why my body is making stones. Did I mention I’ve had five, and that the last one took me to the emergency room for the night? I would do anything not to have another. Dr. Low’s unfortunate assessment was: Medically there’s no reason for your body to make stones. You don’t have any of the risk factors, all of the levels in your urine are normal… there’s really nothing we can do for you. But on the way out, Dr. Low gave me some parting advice. He said that although there’s no hard medical evidence behind it, some people believe that sleeping on the opposite side from the kidney that has had the stones (stones are often out of only one kidney) will help boost blood flow and general openness of the stone kidney. I’m sure he had no idea what kind of left-side-sleeping-obsessed monster this advice would create. God forbid I wake on my right (stone) side… How long have I been here? What’s that funny feeling, is it pressure? Was that a twinge of pain? And off I go into a stream of dazed thoughts about how I probably just suffocated that kidney into making 3 more stones. Let’s just say I’ve taken it a little far. We do this in many areas of our lives. We get a little black and white, bouncing between extremes. I see it in class. An overcompensation. How an instruction like Find a little more connection through your outer heel will have people walking bow-legged. I think this comes partly from being out of touch with subtlety, but mostly from wanting to please, wanting to do well and get it right. Wanting to be better. That’s what I want. I want to be better—-healthy, well, stone-free. Ironically, this wanting to be other than I am is a 3rd chakra phenomena. It shows up in many aspects of my life and could be, in some way that I do not understand, related to having kidney stones in the first place. Chakras are centers or mass groupings of energy in the body that correspond to nerve ganglia branching out from the spinal column. The 3rd chakra, called Manipura, or lustrous gem, is in the midsection of the torso—solar plexus and kidneys. It is all about how we relate to and understand ourselves. It’s where we access our intuition or “gut” feelings. And it controls the entire processes of digestion, assimilation and temperature regulation in the body. In a “healthy” 3rd chakra, we have appropriate self-esteem, self-respect, and self-discipline, ambition and action, autonomy, spontaneity, the courage to take risks, generosity, and proper metabolism. It’s dark side is fear of rejection, criticism, looking foolish and failing to meet responsibilities, as well as anxiety and extreme polarized judgments (good/bad, right/wrong). 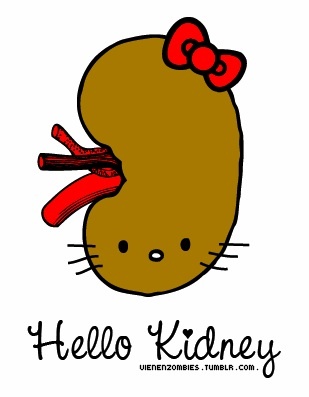 What’s a kidney to do? My teacher Mary Paffard often says that we are a 3rd chakra culture —- adrenalized and perpetually close to burn out. The irony of that is we are also a culture of intense insecurity. Where do you land and how you can respectfully help yourself? If the 3rd chakra is overly excited, “hot” emotions like anger, hatred and excessive attention to power can take over. Passive backbends and easy supine twists can help cool and soothe the 3rd chakra. The simple act of placing the hands on the low belly and feeling the breath can soothe the fight or flight response and help promote relaxation in the body. Effects of 3rd chakra being deficient can be low self-esteem, digestive issues, a feeling of powerlessness and eating disorders. Strong poses (done with mindfulness and kindness) like Sun Salutations, Warriors, Plank and Boat pose can help create warmth, a sense of embodiment and energy. A basic 3rd chakra question is, Do you like yourself? Notice how you answer, and also how you feel about the question or your answer. Maybe you feel poked and you can soften the eyes and feel your breath. Maybe you feel dull and you can sit up tall and let your energy rise. Let me tell you, it’s worth getting to know your 3rd chakra. Not to say that you will have a kidney stone (although stones have been rapidly on the rise for the past few decades). But this path and practice are about knowing oneself, finding middle ground and living life fully amid the risk and loss. The confidence and discipline to do this live in your 3rd chakra. Well, I’m off to have a glass of water (hydration is the numero uno prevention strategy for stones). If you found this helpful, please pass it along! And I’d love to hear from you in the comments. will make a tree grow crooked. we can open up new channels. This has long been a favorite quote, a favorite idea. That we are molded and shaped, physically and energetically, by the winds of life. That what we know as home, what feels comfortable, may be “crooked.” And with mindfulness and gentle effort we can come back into balance. A few weeks ago I was fortunate to see my teacher Mary Paffard. She offered a workshop in which she talked (in part) about grounding, connecting, home, and comfort—earth/1st chakra qualities. The question came up for me, What if the thing that feels comfortable isn’t a healthy place? What if we plant and grow roots in a place that feels like home only because it’s known, not because it’s nourishing and safe? Mary’s insight was that if it is not a healthy place, there will be a feeling of stuckness. The result will be dullness and a lack energy and nourishment. Whereas if it is a healthy place the resulting feeling will be aliveness and engagement. We can strengthen behavior patterns as well as physical patterns by going with habitual comfort. I’ve talked several times about behavior patterns. The same thing holds true around the anatomy of a pose: the most “comfortable” place might not be the best place. Often we go deeper into our pattern because it feels good initially, but pay for it later when the “crooked” pattern is strengthened. Try this: do one of your favorite poses (which most likely is a favorite because it’s easy for you or you feel somewhat successful at it — aka, it supports your body’s favored pattern). What about this pose do you like? 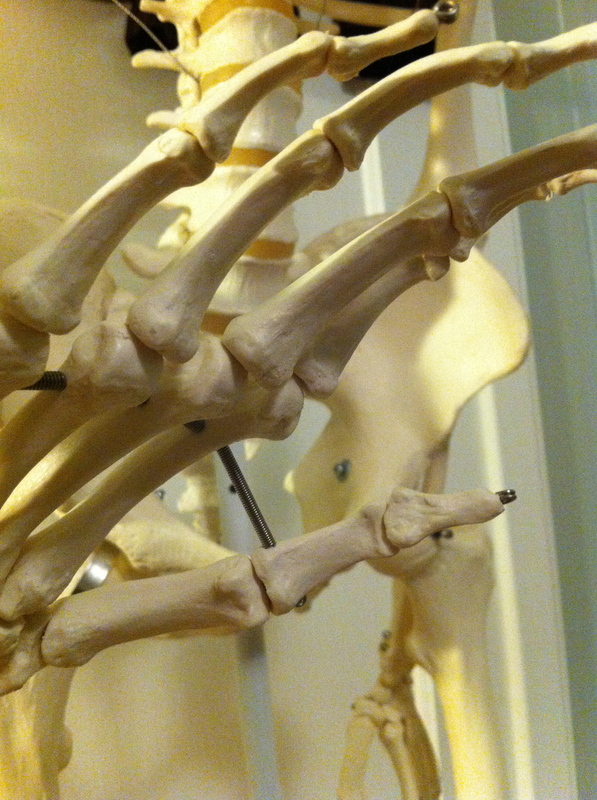 What part of the body feels very receptive to the movement? Now do one of your least favorite poses (which… you guessed it, probably challenges your body’s natural tendency). What don’t you like about this pose? What part of the body isn’t participating? What are the links between the poses? Are they opposite of one another? Do the “easy” natural patterns of your favorite pose try to compensate for the challenging parts of your least favorite pose? 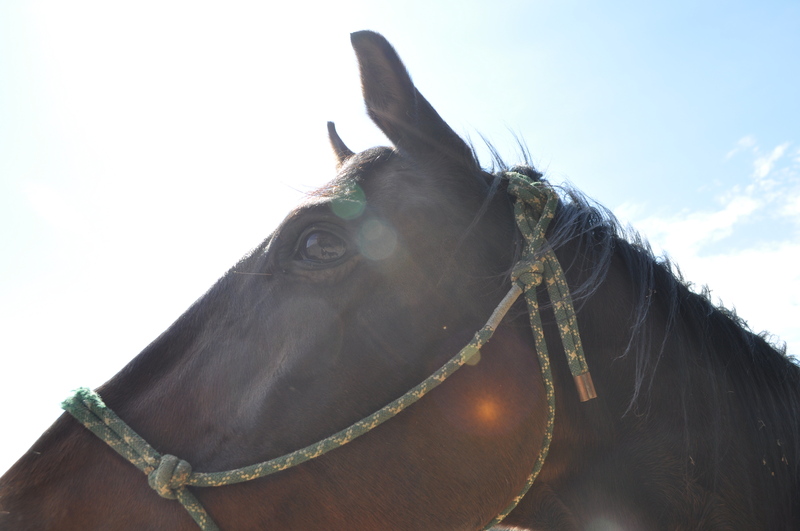 This picture of Cowboy has absolutely nothing to do with the post. I just thought it was pretty. Would love to hear your thoughts and findings of this exploration!